2019-es minőségi divatos galléros pólók, már 2800 Ft-tól. Kedves, gyors és pontos ügyfélkezelés a szakterületünk. Ez az Orion Divat Webáruház, a megbízható magyar webshop. Lonsdale Stripe férfi pólóThe Lonsdale Stripe Polo features a traditional three button placket with a fold over collar and short sleeves for a comfortable fit, styled with a stripe design and the brands Lonsdale Lion logo.> Mens polo shirt> Short sleeves> Fold over collar> 3 button placket> Stripe d..
Lonsdale Jersey férfi galléros pólóThis Lonsdale Polo Shirt delivers a traditional style thanks to the buttoned placket and fold over collar, styled with contrasting trim to the collar and cuffs, finished with the brands logo.> Mens polo shirt> Short sleeves> 3 button placket> Contrasting trim> Lons..
Adidas 3 Stripes férfi galléros póló Get an iconic casual appearance with the adidas 3 Stripes Logo Polo Shirt, crafted from a soft cotton pique with a two button placket, regular fold down collar and short sleeves with ribbed cuffs in a regular fit. Completed with familiar three stripe branding to ..
Adidas Fab férfi galléros póló This Mens adidas Fab Polo Shirt has been crafted with Climalite technology that wick sweat away from the skin to keep you feeling dry teamed with a lightweight and breathable design along with a three button placket and short sleeves for a comfortable fit.> Please not..
Slazenger Tipped Mens Polo Shirts Get a everyday look that is smart and stylish with this Slazenger Tipped Polo Shirt, it is crafted with short sleeves and a 2 button neck fastening. A striped trim finish is situated on the collar and sleeves for a stylish look whilst its embroidered Slazenger brand..
Slazenger Plain Mens Polo Shirt This Slazenger Plain Polo shirt is a basic style that is sure to look great with any outfit. The polo features a regular collar and short sleeves with a three button placket for a comfortable fit. The top is finished with split sides and an embroidered Slazenger logo..
Slazenger férfi kockás galléros pólóConquer your next round of golf with the Slazenger Check Polo Shirt. Crafted with a regular fold over collar and 3 button placket, this piece features short sleeves and is a lightweight construction. Design is complete with a chequered print and Slazenger brandin..
Slazenger Micro Stripe férfi galléros pólóThe Mens Slazenger Micro Stripe Golf Polo Shirt is perfect for the next time you hit the green. 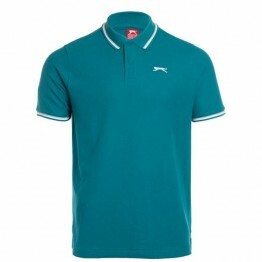 Featuring a two button placket and short sleeves, this piece is complete with an all over micro stripe pattern and the Slazenger branding to the top left chest. 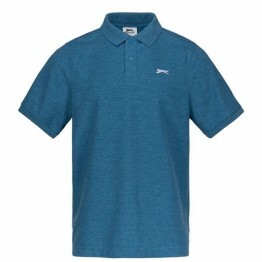 >..
Slazenger Golf Solid férfi galléros pólóConquer your next round of golf with the Slazenger Golf Solid Polo Shirt. Crafted with a regular fold over collar and 3 button fastening placket., this piece features short sleeves and is a lightweight construction. Design is complete with an embroidered logo..
Pierre Cardin Pique férfi galléros pólóThe Pierre Cardin Pique Polo Shirt features a contrasting collar with matching tipping, crafted from 100% cotton for a comfortable fit.> Mens polo shirt> Short sleeves> 2 button placket> Fold over collar> Ribbed trim> Pierre Cardin Signature ..
Pierre Cardin Cut And Sew férfi galléros pamut póló The Pierre Cardin cut and sew polo is perfect for everyday wear with a regular, comfortable and casual fit. Designed with a classic fold down collar that features a three button fastening placket, three cut and sew tri coloured panels, single colou..
Nike Match Up férfi galléros pólóThis Nike Polo Shirt comes in a plain but stylish design with short sleeves, fold down collar and two button placket. It is complete with the signature Nike Swoosh on the chest. > Men's polo shirt> Fold down collar> Short sleeves> Two button placket> Side splits> Nik..